Equity markets fell sharply last week as Wall Street grew concerned over an accelerating rise in bond yields; the S&P 500 falling 2.12% on Friday, extending a 1.74% loss earlier in the week. Losses accelerated on Friday when the Labor Department reported a strong January payrolls report (200,000 new jobs added and unemployment holding unchanged at 4.1%), but average hourly wages unexpectedly spiked 2.9% year-over-year (YoY), its largest 12-month increase since May 2009. Wage growth of that magnitude prompted fears that the Federal Reserve could respond with a more aggressive stance in raising interest rates. All three domestic averages extended declines in reaction and finished the week at session lows. The Dow Industrials fell 666 points (-2.54%) for its largest percentage loss since a 3.39% selloff in June 2016. The Nasdaq Composite retreated 1.96%, with a larger 2.1% loss on the Nasdaq 100. Treasury securities prices slumped, sending the yield on benchmark 10-year Treasury notes up over 0.18% last week, its largest weekly increase since just after President Trump’s election. This chart illustrates that manufacturing activity is off to a strong start in 2018 and the current upswing may continue through the year. 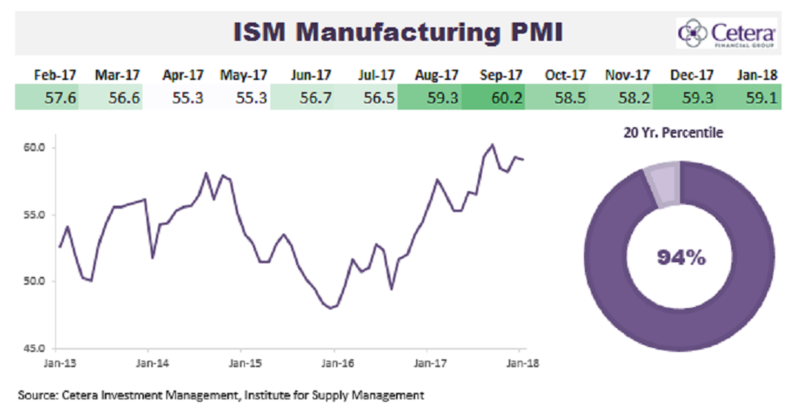 In January, the ISM manufacturing PMI dropped slightly to 59.1 from 59.3 in December. Overall, the trend in manufacturing expansion remains in place, despite the narrow drop this month. The 12-month average climbed to 57.7, which is the strongest year-over-year (YoY) average since 2011. A PMI reading above 50 signals expansion and the average reading for this expansion is 54.3. Over the last 20 years, the ISM manufacturing PMI has been higher only 6% of the time. We expect manufacturing to expand throughout 2018, barring an unforeseen economic shock. There is a strong tailwind for the sector this year, driven by tax reform, a weaker U.S. dollar, and economic growth that is synchronized on a global scale. According to Capital Economics, a manufacturing PMI reading this high is "consistent with GDP growth of over 4% annualized."